For Christmas, Mr. Pirate & I gave our 2 youngest daughters (now 19 y/o) digital cameras (mainly so they would leave MINE alone!). Along with the camera, we also gave them cases to carry the camera in. To distinguish the camera cases (besides the different colors), I wanted to put their initials on the cases. Direct machine embroidery was impossible .. but ... if I could find a letter style that lent itself to being a free-standing type, then I could applique the embroidered letter to the case! I started looking at the alphabets I have. It needed to be no bigger than 1-3/4" wide by 2" high. It needed to have smooth edges and no loopy/skinny extensions. They didn't necessarily need to be free-standing lace. I found what I needed .. hooray! I hooped water soluable stabilizer (vilene type, not the film type) and put black tulle on top of that. I then stitched out the letters. When the stabilizer was washed out and the letters dried, I cut them out,leaving a generous margin of tulle all around. 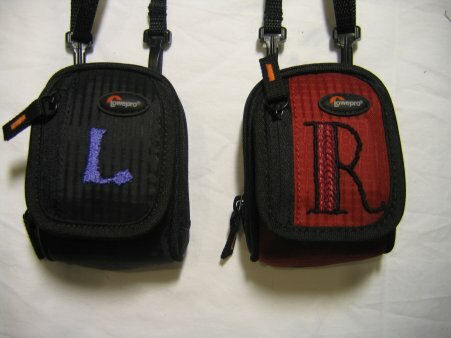 I then hand-appliqued the letters to the camera cases. When the stitching was done, I trimmed the excess tulle away. The result looks like I machine embroidered directly onto the cases! I was very pleased with the result. If it turned out that the recipient really did NOT like the letter style, it could always be removed without harming the case. Fortunately, both girls liked the letters I chose for them. I know exactly which websites I got the alphabet sets from, but unfortunately, these specific letters are no longer on either site. The "L" came from A1 and was their ALPHA LACE design. The "R" came from Embroidery Forums and was their DECO design. (Embroidery Forum has reorganized their site and I have NO idea where anything is or even if many of the lovely designs I got from them are available at all).